LAND ACQUISITION BILL IS THE ONLY SOLUTION TO STOP FARMERS’ SUICIDE Data table shows farmer suicide from 2004 to 2013 of major states. These figures can be half within 5 years only if bill implemented immediately. 1. 2008, UPA govt waived farmers’ loan Rs. 72000 cr. Purely pre-election move to fetch votes. 2. Subsidies for MSP and food 125000 cr + Urea 72000 cr + add power/Diesel. 3. Total Rs. 2,75,000 cr. Such a huge amount even could not stop suicides, simply means we have to think some better alternative. 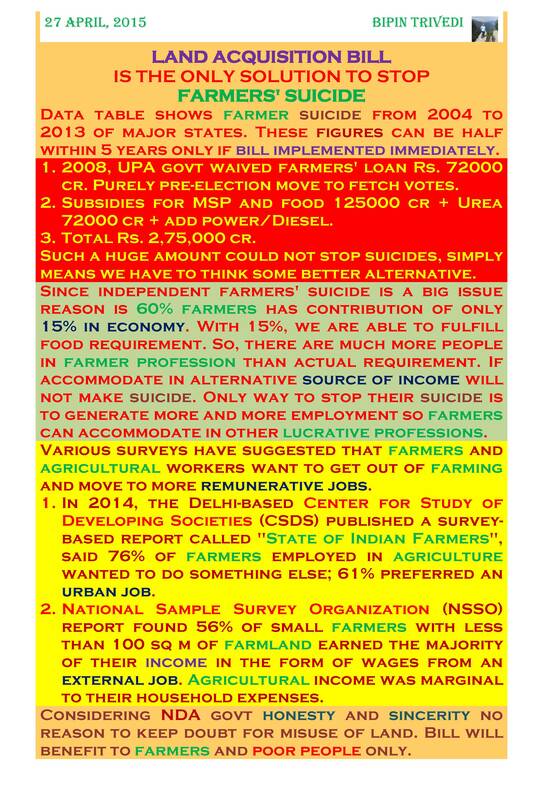 Since independent farmers’ suicide is a big issue reason is 60% farmers has contribution of only 15% in economy. Even with 15% contribution, we are able to fulfill crop requirement for India population. Simply means there are much more people in farmer profession than the actual requirement if they can accommodate in other alternative source of income they will not make suicide. Only way to stop their suicide is to generate more and more employment so farmers can accommodate in other lucrative professions. Various surveys have suggested that farmers and agricultural workers want to get out of farming and move to more remunerative jobs. 1. In 2014, the Delhi-based Center for Study of Developing Societies (CSDS) published a survey-based report called “State of Indian Farmers”, said 76% of farmers employed in agriculture wanted to do something else; 61% preferred an urban job. 2. National Sample Survey Organization (NSSO) report found 56% of small farmers with less than 100 sq m of farmland earned the majority of their income in the form of wages from an external job. Agricultural income was marginal to their household expenses. Considering NDA government honesty and sincerity no reason to keep doubt in mind for misuse of land. Bill will benefit to farmers and poor people only. This entry was posted in Uncategorized on May 1, 2015 by trivedi153.